Have Gun Will Travel – western TV show. This western TV series was created by Herb Meadow and Sam Rolfe. The regular cast is Richard Boone, Kam Tong and Lisa Lu. This western television series has 225 episodes and originally aired from 1957 – 1963. Richard Boone stars as Paladin. A professional gun for hire who would rather settle things without having to use his perfectly balanced Colt 45. As a back up weapon Paladin also carried a secret hide away Derringer. Very Popular Western television series that aired on CBS from 1957 through 1963. It was rated number three or number four in the Nielsen ratings every year of its first four seasons. There are 225 black and white half hour episodes. June Lockhart was cast twice in the role of Dr. Phyllis Thackeray. Her first appearance was in the episode “No Visitors” in which she portrays a groundbreaking female physician who has diagnosed a case of three-day measles instead of the smallpox that a fire-and- brimstone wagonmaster had decided was reason enough to abandon a mother and child alone on the prairie. Paladin rescued them and finds a kindred spirit in the lovely Dr. Thackeray. In “The Return of Dr. Thackeray,” which aired May 17, 1958, Paladin’s physician friend diagnoses a cook with smallpox. Dr. Thackeray worries that the disease has infected the ranch hands employed by wealthy ranch owner Sam Barton, played by Grant Withers, coming in from a cattle drive because Barton and his weak son refuse to take responsibility for containing the outbreak on their ranch. Singer Johnny Western – who performed the series’ closing ballad – appears as an immature gunslinger. Paladin shows a softer side as he and the lovely Dr. Thackeray talk about why they are not ready to change their lives and marry. 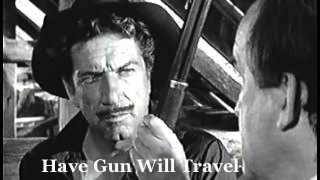 CLICK ON THE PHOTO TO GO TO Have Gun Will Travel – western TV show VIDEOS. Perhaps as a favor to his son, Andrew, HGWT’s original and main director, famously craggy Oscar-winning actor, Victor McLaglen, one of the most reliable of director John Ford’s stock company, appeared in the first season as Mike O’Hare, an Irish architect trying to build a dam in the wilderness against the wishes of a nearby town in “The O’Hare Story”. As a mark of distinction the elder McLaglen was billed in the opening credits after Richard Boone. Kevin Hagen appeared five times, long before he was cast as kindly Dr. Hiram Baker on Michael Landon’s Little House on the Prairie. Roy Barcroft the character actor whose glance could shake planets in science fiction serials in the 1930s and 1940s, was well-remembered as kindly Colonel Logan in the “Spin and Marty” segments of The Mickey Mouse Club. He appeared in eleven episodes in various roles. Harry Carey, Jr., who also appeared in “Spin and Marty” as Bill Burnett, could be seen in segments of most every western television series made in the 1950s. He was part of the John Ford stock company and appeared in movies with John Wayne. He appeared thirteen times on Have Gun – Will Travel. Hal Needham, ace stuntman and character actor, who later directed several successful films, appeared in twenty-six episodes. Ben Wright, born in London, was one of the most prolific of actors on television in the 1950s–’60s. He appeared in six episodes when not doing voice-overs for Disney movies such as One Hundred and One Dalmatians and The Little Mermaid, or appearing in Gunsmoke or Twilight Zone among dozens of other series. His most visible role in films was as Herr Zeller, the Nazi official in The Sound of Music. It should be noted that Ben Wright regularly played Hey Boy in the radio version of HGWT. Olan Soule, who had a long career in movies and television, appeared in eleven episodes as Mitchell or Mr McGinnis or Matthews depending on the episode (perhaps his name is Mitchell McGinnis Matthews?) the Hotel Carlton’s manager/front desk clerk, although he’s also called Mr Cartwright, the assistant manager, in the episode, “Hobson’s Choice”. He was spelled a few times by Peter Brocco, another oft-seen character actor who also appeared in “The Cream of the Jest” as the scientist employed to make up Paladin’s custom-made bullets using Paladin’s own formulation for smokeless gun powder. Fintan Meyler was another busy actress in television of the era. She appeared in four episodes, twice appearing as Pegeen Shannon, an Irish lass with a penchant for getting into trouble. Denver Pyle bounced between films and television up to the 1990s when he hit it big in The Dukes of Hazzard. He appeared eight times. George Kennedy, years before he famously beat up Paul Newman in Cool Hand Luke and starred on TV as Sarge, appears in six segments. Charles Bronson, later one of the screen’s most popular action stars, appeared in five different roles, from the second episode up to the last season. Jena Engstrom appeared in three episodes, and her mother, Jean Engstrom, appeared in two in 1961 and 1962. Jena first appeared in the 1961 episode “The Fatal Flaw” with guest stars Royal Dano and Allyn Joslyn as the resident of a mountain cabin where the three men, Paladin, a U.S. Marshal (Joslyn) and a captured outlaw (Dano) take refuge in a blizzard. Her second appearance was with guest star Duane Eddy in the episode “The Education of Sarah Jane” where the youngsters are the latest in the line of feuding families who have killed one another for years. In “Alice”, Jena appears as a former saloonkeeper’s daughter who hires Paladin to find her mother (Jeanette Nolan as Alice). Jena’s mother Jean Engstrom first appeared as an unwed, expectant mother befriended by a runaway bank teller (John Fielder) in “The Gold Bar,” and then as an ex-gunfighter’s widow in “Place for Abel Hix” with Robert Blake. Pernell Roberts, before starring as Adam Cartwright on Bonanza and Trapper John McIntyre on Trapper John, MD, was a scheming railroad employee in “Hey Boy’s Revenge”. Carol Thurston appeared twice, as Martha Whitehorse in “Winchester Quarantine” (1957) and as Nita in “Heritage of Anger” (1959). Episode Guide for the Have Gun Will Travel – western TV show. This entry was posted in Have Gun Will Travel – western TV show, Western TV Shows Full Length and Free to Watch Online and tagged American West, complete, Episode Guide, episodes, free, full length, Have Gun Will Travel, Herb Meadow, Kam Tong, Lisa Lu, old west, online, Richard Boone, Sam Rolfe, series, shows, television, TV, Victor McLaglen, watch, western, western TV show, westerns. Bookmark the permalink.